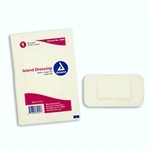 Finding a medical device supplier with Island Dressing 2 X 3.5 Sterile (indv. Bagged) 6/50/cs in stock isn't always easy - you need a experienced company with a high level of both knowledge and service. Medical Device Depot is the premier source that will be the most responsive to your needs and the most beneficial to your company. We pride ourselves on treating customers like the superstars they are and providing the most helpful and accurate information available. Call us anytime at 877-646-3300. Unless specified, shipping charges are added to each order at checkout, based on the specific items. Expedited shipping is available at an additional charge. We accept all major credit cards and will charge you within 24 hours prior to shipment of your item(s). Looking to lease instead of buy? Most of our products offer a lease application right on the product page - you can conserve your working capital and get tax deductions for all your medical device needs. Our site offers the highest level of security and encryption, backed by Volusion Secure Site SSL and Norton Secured by Verisign, so you can shop worry-free.